Solar power is all about Battery Charging, something we do know a little bit about. "I would like to thank you for all your advice regarding solar panels, batteries and Schaudt Solar Panel controllers. I have had the new Solar Regulator installed from early September and am amazed by the improvement in performance over the previous unit installed by my motorhome dealer. Even in the recent poor weather both leisure and chassis batteries are maintaining full charge and I rarely need to use hook up unless using a lot of electric heating. I am really very grateful and well pleased. The cost of the regulator was quite high but boy was it worth it. We no longer do any Solar Installation work or sell any Solar Controllers, but that makes this advice impartial, not sales related. Price does not include import duties, which are about £21. "Hi Allan, Thank you for contacting me through ebay. If anyone wanting Votronic items, buys directly from us (not ebay) and pays by bank transfer into my UK bank account, we could offer 8% discount. Buying direct but paying by Paypal, we can offer 5% discount. Just tell them to mention A and N Caravan, so I know. Tell them we can discuss any possibility through email, some may not need import duties, just ask them to email their enquiry direct - xolar06@gmail.com. If it's for a Schaudt equipped vehicle, like a Hymer, then also ask for the Schaudt compatible cables, Votronic part number 2007. The Votronic 250 also has an AES Fridge 'trigger' that can switch a Fridge from Gas to 12v when the Solar supply is high enough. Note that to power a conventional AES Fridge on 12v, the Solar Panel has got to be capable of supplying at least 13.5v and about 14 - 17 amps. That is the minimum power that a typical 12v Fridge element requires to operate. Any less and it will just take the excess from the Habitation area battery, running it flat. We are not fans of the Victron ranges of Solar Regulators as they are not designed specifically for a motorhome. Almost all manufacturers now provide connectivity for Solar into the Sargent/Elektroblock Power Controller. When this connectivity is used, it enormously simplifies the wiring, improving reliability and functionality. For example on the Sargent Power controller/Charger units, like the EC328, you can buy a cable that uses the inbuilt Solar Regulator in the EC328 allowing the Sargent's 'smart charging' to automatically route Solar charge to the Starter battery or Habitation area battery as required. The cable costs about £14, plugs into the EC328 and the other end connects to the Solar Panel. You don't even need a Solar regulator. See HERE for more details. Please don't rely upon the Solar panel supplier as many lack experience about Motorhome Power controller/Charger installations. Almost all will tell you to wire it through to the habitation battery with separate cabling going to the Starter battery. Not only is that a lot more time consuming, but expensive, more complex and less efficient/reliable. Follow the way the motorhome manufacturer/Power controller supplier recommends it to be done. Anything else might invalidate warranty/functionality. For detailed information about Schaudt Elektroblock units and Solar Power CLICK HERE. We suggest you spend time on working out how much 12v power you use, so know exactly what you need to harvest each day to put that back. Remember that a 100w Solar Panel may give 5amps in the middle of Summer in the Sahara, but only 0.9amps in Inverness in December. Even less if it is cloudy/wet. See the bottom of the web page for info on how the angle of the sun in the sky affects the Solar harvest. 1. It is standard Electrical Industry practise to install a Fuse in any 12v power cable at the battery 'power' end. This is to protect the devices and the cable. A Solar array can be a big power Source, if the cables are shorted there will be amps across them. A Solar Array is a power source in the same way that a battery is. It is lower current but will still melt wires and Solar Regulators. Therefore please install fuses into the cables as soon they come in through the roof. We rarely see a professionally fitted Solar Install that builds in this electrical safety. There is always a fuse on the battery side of the Regulator, but rarely one on the Solar Panel side of the Regulator when there should be both. Fit a Fuse between the Solar Panel and the regulator that is ideally bigger than the 'normal' Solar Panel current but lower than it's Short Circuit current, not just to to allow some electrical protection, but also to allow you to isolate the Solar Panel from the regulator during maintenance work. Like changing the batteries. Failure to isolate the regulator from the Solar panel during battery maintenance can lead to solar regulator failure or damage to electrical items inside the vehicle. Consider putting a label inside the battery box on the leads to remind engineers/you to pull the Solar Panel fuse first with information on where it can be found. Click here for a page to print off to put in the Battery box, or for suggestions on the text. 2. Install the regulator as close to the Power Controller/Distribution unit or Battery as possible. The Solar panel can have voltages higher than 25 volts when it's working effectively, output from the regulator can be less than 13 volts on a Cloudy day. Therefore in an ideal world you want the longest part of the cable run to be at the highest voltage to keep voltage drop to a minimum. The 13v cable section from Solar Regulator to Elektroblock should be the shorter run. Put another way, if you lose 1.5v from 27V on the way to the Solar Regulator, 25.5v will still arrive for conversion down to 14.4v to charge the battery. But if you lose 1.5v on a long cable run after it has already been 'regulated down' to 14v, your battery is going to get only 12.5v and little or no charge. These are not realistic examples, just there to ilustrate the point. The actual voltage drop is low, but when we are talking about fractions of volts/amps in Winter, every tiny bit of power counts, and adds up over the year. Many of the better Solar regulators specifically state it should be mounted within 30cm of the Battery/Power Controller. This often puts the regulator in a position under a bed, under the Drivers seat, in outside locker, etc which means it won't ever be seen so the Motorhome specific regulators NEVER have a built in screen, for obvious reasons. If it has a built in display that you will rarely be able to clearly read, then it is obviously not designed for a Motorhome, but for House Roof Solar. I have a manual for a Stecca PRS3030 where the installation instructions state it should be mounted on a Concrete fire proof wall using 40mm Screws longer than the usual Caravan/Wall thickness. Quite clearly not meant for a Motorhome (and less effcient as a result) yet so often the choice of the 'Professional'. Inadequate thought at the wiring installation phase can have a significant effect on the charge rate in low light conditions. The exact conditions when every milliamp counts. If you have a Solar installation and the Solar Regulator is located up near the roof a long way from the batteries, the Installer did not understand basic Electricity. Get it checked as in our experience there will be more things awry. Like Fire Safety Fuses not fitted, Battery Masters installed, etc. It doesn't just tell you amps and volts like some of the others, but also displays the amps over hours, so displays the total number of Amp hours input each day into the battery. It is very easy to wire in, some of the other models are more complex and require extra components. You can install it between the Solar Regulator (Source) and the Power Controller/Sargent (Load). However, installed in this way it will draw about 8ma all the time to power the LCD display, even when the Sun goes down. If you wire it between the Solar Panel (Source) and the Solar Regulator (Load) it will use the power from the Solar to drive the LCD display, but obviously once the Solar Panel stops producing power there will be no power to drive the display so it will shutdown until the Sun returns. This is how we recommend you wire it as it's more efficient and means you can site it away from the Elektroblock/Sargent Power unit which is usually in an inaccessible place. However, each day it will 'shut down' and you will lose 'long term' information and all the counters will reset to zero. For maximum efficiency keep the cable run short. Note while it is 'rated' at 100amps, the cabling suggests less than 50amps will overload it. Suggest you regard 30a as it's permanent maximum limit. These meters are accurate and will tell you what power has been put into the Batteries over the entire Solar Day, the total Amphours put in, plus the usual Volts and Amps. Great for diagnostics as well and tracking how fast the Solar panel is deteriorating. It doesn't need to be this exact unit, just something similar, but these are very easy to wire up. It shows battery capacity and watts, amps, etc. but we have never installed one. 3. We suggest you plan on including both Engine Starter and Habitation Battery in the Solar charge installation. Modern Motorhome specific Alarms use less current than they used to but can still drain a Starter battery inside a month. Old style Trackers/Alarms can take down a Battery in weeks. In storage a good Habitation battery won't need much charge, but the Starter battery might because of the permanently active ECU/Alarm, etc. So the Starter battery can help draw any excess Solar Charge away from the habitation batteries reducing the risk of habitation battery overcharge. Therefore opt for a Dual battery Solar regulator that will charge both batteries at the same time. The old way of fitting a single output Solar Regulator with a 'Battery Master' style device to trickle charge the Starter works, but there are now much more efficient and better ways of doing things with more modern technology and at lower cost. Dual output Solar regulators are now less than £30 and will charge both batteries directly, without the need for any other item, like a Battery Maintainer at an extra £50. Therefore going for the the more efficient option will put more power into the batteries, with fewer losses, greater reliability and will also save around £50 overall. If you really want to use a Battery Maintainer, the most efficient one, that also has the highest charge rate, is the Sterling, followed by the CBE unit. 4. If the Solar regulator has be sited a long way from the Elektroblock/ Sargent Power Unit, you should consider larger core cable (4.5mm minimum?) between the regulator and the EBL to minimise voltage drop. If the regulator is close to the Elektroblock the quality of the cable is less important as the voltage through the cable from the panel is much higher so the drop is significantly less. 2.0mm is the suggested minimum cable as it is stronger but in a good 100w installation as thin as 1.0mm cable with a current rating of 14amps may be sufficient? On a big array the more important factor for the cable will be the current rating, less so the voltage drop. 5. Don't put a second fuse between the Regulator and the Power Unit if the Sargent/Elektroblock Power unit already has one. On a Schaudt Elektroblock don't forget to populate the Solar Regulator fuse slot with the correct rated fuse otherwise no charge will take place. But only do this as one of the last tasks just before you put in the Solar Panel 'isolating' fuse mentioned in Step 1 otherwise the wiring will be 'live' during installation. On a Schaudt install, the minute you plug in the three pin Solar Cable into the front of the EBL, the cable will be live as the cable will be passing the battery voltage via the Elektroblock socket. Don't plug in the 3 pin EBL connector until almost last. 6. Although we say use the best regulator you can afford, it is the easiest part of the installation to change later. Therefore if the budget is tight, spend the biggest part on the Solar Panel, as once it's in situ it is not easy to replace. The next priority should be the wiring, as once it has wound it's way through cupboards and under floors it won't be something you want to do twice. 7. Solar Panels are less efficient when hot, so a cooling gap of at least 25mm between MH and panel is recommended to allow them to stay cool. Flexible Solar Panels are usually glued directly to the roof without any cooling air space, as a result they often get hotter than ideal with a resultant drop in output and sometimes premature failure. This is one of the reasons why many Flexi Solar installation owners are disappointed with the end result. Note that Flexible panels generally have the highest degradation as they age, typically only 50% power output at 5 years. The top of a fixed panel is usually Glass, but almost all flexi panels use a clear 'plastic'. You will have noticed how Car Plastic headlights and 'GreenHouse' Plastic 'clouds' and scratches after a few years? The disappointing output, installation issues and short life expectancy are the reasons we suggest Motorhome owners avoid Flexible panels. If you do fit them, bear in mind that they may need to come off in a few years following premature degradation? 8. It is very important that your panel is not in shade for any part of the day. Even the tiny shade of a radio aeriel can drop the panel output by 25%, depending on it's construction. The shade of a skylight on just 5% of the panel can drop the output by 40% leading to possible Panel failure. 9. BATTERY BANK SIZING : To make the most of Solar Harvesting you may wish to consider extra batteries to store the energy but remember that you should not exceed the battery bank size of the Charger/Controller manufacturer and the Motorhome Design. Most chargers support a battery bank of 10 times the charger output, so the majority of newer Schaudt 18A chargers will support 180Ah. However, bear in mind that the charger in most Continental built Motorhome also charges the Starter battery so an allowance should be made for this. So using the Calira above as an example if it supports 200Ah and we allow 20Ah for the 100Ah Starter battery, that leaves 180Ah for the Habitation battery bank, 2 x 90Ah MAX. Note the lack of support for AGM batteries? Just Wet Acid and Gel. Few Motorhome and almost no Caravan chargers are optimised for AGM. A Burstner Reich e-Box 1 only has a 16A charger (just like the early Schaudt charger/controllers) supporting a combined bank of 160Ah. If you allow 20Ah for the Starter battery that leaves just 140Ah for the habitation battery. Not surprising they fail when 2 x 110Ah habitation Batteries is common. The worst we have seen, on a Reich e-Box equipped Burstner was 4 x 110Ah. These 3 extra batteries were fitted by the Dealer who quite happily kept replacing the Reich e-box when it failed each Season, handing the customer a £720 bill each time!! The later Reich e-Box 1 PLUS has a 20A Impulse charger allegedly capable of supporting a 200Ah total (with Starter) battery bank. But it isn't a strong unit. Consider the impact on the wiring and the Alternator. Not all Motorhomes can support additional batteries, see our webpage 'Adding a Second Battery' for examples of why some Motorhomes cannot support more than one battery. Batteries should be the same age, technology and capacity. Mixing a 12 month old battery with a new battery or a 90Ah with a 110Ah may lead to early battery demise and longer term charger failure. You are likely to end up with one battery doing all the work and the 'real' battery bank capacity being much less than you expect. See our Battery Charging Faults page for more info on the implications of larger battery banks than designed. 10. When wiring a Solar Panel, work from the Motorhome charger/distribution unit back towards the panel, fitting the Elektroblock/Power Unit Solar fuse and then the Solar Panel fuse, as noted in Step 1, last of all. This ensures that the wiring isn't 'live' until its all connected. 11. Use a quality Solar Regulator designed for a Motorhome. We advise a switch to quality Wet/flooded acid batteries. See our Battery Technology page as to why. Many budget Solar Regulators are only designed to charge a single battery bank so charging of multiple banks, such as Habitation and Starter, requires additional components reducing reliability, adding complexity and cost. Update 2016: More Solar regulators are becoming available that support two battery banks. However some split the charge 50/50 which is not appropriate for a Motorhome where you normally require 97% to the habitation batteries and 3% to the Starter battery. . The very best Solar regulators will use Maximum Power Point Tracking, MPPT, technology which can produce 20% more charge than a normal Solar regulator, in low light conditions. An MPPT regulator can harvest as much power from a 100watt Solar Panel as a standard regulator can from a 120watt panel in typical UK poor light conditions. We recommend the Votronic MPPT range. 12. Please think carefully about your batteries. What is the point in spending a lot of money on a Solar System and then using a battery that takes 140Ah to give you a usable 100Ah? By having a less efficient Battery you could be wasting 30% of the Solar Power. Batteries are no longer all the same, there can be huge differences in efficiency between the best and the worst at the same price. Even a new 100Ah battery of the highest quality will need about 110Ah to get fully charged. The least efficient batteries, sometimes old style Traction/Leisure batteries can take 130Ah to give a usable 100Ah. One of these Traction/Leisure Batteries at 3 years old can absorb 140Ah but give back only 100Ah, such can be the conversion losses. That can be 40% 'lost charging' from a Solar panel, effectively a 'real' 60 watt panel, not the 100 watt you thought you had. Bosch/Varta claim up to 70% better electrical conductivity for their Powerframe LFD range than a conventional battery, that is a lot of extra real power. The above might be extreme examples. but show the point. A Varta Silver LFD 90/Bosch L5 Powerframe is more efficient than any other battery we know of. As a result of this high technology based efficiency, it charges twice as fast (in the average Motorhome) as a Gel battery and faster than an AGM battery. See our Battery technology Page. It also has a similar almost 13v resting voltage as other modern batteries, like VRLA. This chart below was produced by Yuasa, one of the biggest battery manufacturers in the World. It shows how Sealed/VRLA batteries have a higher 13v resting voltage than a conventional battery, which is only 12.6v. The Varta LFD90/Bosch L5 has a resting voltage closer to 13v, so behaves like a VRLA, which you can see have a full 1 volt range from 13.0v down to 12.0v. Conventional batteries have a more limited voltage range of only 0.8v from 12.6v down to 11.8v. You will note that a 50% discharged Powerframe Varta LFD90 is almost the same voltage as a FULLY CHARGED conventional battery. This one feature shows how advanced and different these Powerframe battery ranges are. Because of the technology, these batteries perform at their peak long after other batteries are in decline. It also does not lose its charge when standing idle. These batteries also handle extremes of temperature better than rivals. AGM and Gel can have significantly shortened lives if used in Sunny Climes, where Solar power is often deployed. This is an important consideration for Motorhome owners as the most power will be thrown into the battery at the hottest part of the day by the Solar Panel. It doesn't take a genius to work out that if a battery is more efficient it will require less energy to recharge. When so many people are fitting Solar Panels with only a few amps output, Battery efficiency has a big impact on the power available. It is important not just because it charges in half the time, but because the strain on the charger is literally cut by half, whether that be the Alternator or 230v charger. Also consider the implication for that Honda Eu10i Generator, with decent batteries, it might run for half the time using half as much fuel. Add on a second mains charger, and a low power generator can bring two Varta LFD 90Ah batteries back up to near full capacity in a couple of hours. 13. If your Solar Installation uses a Battery Maintainer style device to 'charge' the starter battery then it is poorly thought out. They work in different ways, but typically a Battery Master device claims to monitor the Habitation and Starter batteries and whenever there is a greater than 0.5v difference between the batteries (or the donor battery goes above 13.5 or thereabouts) the Battery Master will steal power from the Habitation battery. Except that it is not monitoring the battery voltage but the voltage at the battery, which can be very different. For example by the end of a nights Free Camp the Habitation battery could be down to 12.4v but the Sun comes up and the Solar Regulator starts charging Habitation battery at 14.4v. The battery maintainer doesn't know the battery is at 12.4v, it only senses the voltage at the battery has risen so triggers and straightaway steals power for the Starter battery, just when you really want to shove all the power you can get into the habitation battery. Installing a more efficient Dual battery Solar regulator that gives priority to the Habitation battery is more efficient and cheaper. The battery maintainers all absorb some power from the battery they are 'Watching', in the case of the vanbitz Battery Master this runs down both the Starter battery it is supposed to be protecting and the Habitation battery when it is idle. The power draw is small, but still a greater loss than a Dual battery Solar Regulator. Additionally a Battery Master charger will also sap some of the power it is transferring as it won't be 100% efficient. However, the prime reason you should not use one of these 'Charge Theft' devices is because almost all Continental built Motorhomes already have the functionality built into the Charger/distribution unit. Installing one of these Battery Master devices may short circuit the functionality of a Schaudt Elektroblock, Reich e-box, Toptron, Arsilici, Calira, etc. In British built Motorhomes from around 2011 the electronics, like the Sargent EC328, also charge the Starter battery via internal circuitry and have a specific Solar Power input connection with built in regulator. For Information on how to wire a Sargent EC325/328 equipped Motorhome with Solar, see our Sargent page. 14. We don't advise a battery is left on long term EHU/Solar charge. Some of the battery manufacturers are becoming aware of this user trend and starting to advise against it. There is evidence that while a float maintenance charge of 13.8v given out by most chargers is ok for short term Float charging, there is growing data to suggest that it is too high for long term maintenance. Keeping a battery charged up using a solar panel sounds like a great idea but can actually do more harm than good by overcharging the battery. Some batteries are more susceptible to overcharging than others but even good quality batteries can be damaged if they weren’t designed to be on constant charge". Full document near the bottom of the page. Yuasa are the latest to advise against the trend. The website now contains a warning that their batteries WILL suffer, potentially reducing it's life to just 2 years. See : Long term EHU? - Yes or No. The new Schaudt LRM1218 Solar Regulator has a reduced Float/Maintenance charge dropped down to just 13.4v, obviously supporting this concern that 13.8v is higher than ideal. Some of the Votronic Solar range use an even lower 13.3v. New Victron Energy mains chargers now have an additional 'Storage' mode where it charges at just 13.2 for long term 'Trickle', 'Float' or 'Maintenance' or whatever term you know it as. Almost all battery manufacturers specify a long term Float/Maintenance charge of 13.2v to avoid overcharge and fluid loss, such as those in Battery backed Data Centre, Hospitals, etc. We suggest that you only buy a Solar Regulator that has a maintenance/Float/trickle charge of 13.2 - 13.4v in line with this lower suggested limit or find some way of switching off the Solar panel when the battery does not need charging? We suggest that if you have one of the old generation (pre 2016) of Solar Regulators you think about either an update to a low Float/Maintenance voltage version or isolate the Solar Panel from the regulator when the battery is full and reconnect every 3 - 4 weeks for a few days. Obviously the actual time interval will depend on many factors, which you need to assess yourself. 17. Battery to Battery (B2B) chargers and Solar power. Some B2B's, like the Stirling units, use a voltage sensing circuit to operate, not a signal the usual Alternator trigger used by most Motorhome standard charging systems. The Sterling style units monitor the voltage at the Starter battery and if it goes above 13.2v the B2B assumes the Starter battery is now being charged by the Alternator, so the B2B swings into action. The problem is, many Solar power solutions also charge the Starter battery often raising it above 14.0v. This can cause the B2B to start up and may start sucking life out of the Starter battery, but there is no Alternator spinning to put the power back. Suggest you do not use a B2B that uses Voltage Sensing technology to operate, at the very least make sure it is compatible with the other electronics and charging systems? Please be aware when buying cable, that Automotive cable often appears to have the same measurements as general cable but the cross sectional area can include the plastic insulation, not just the Copper core. Therefore General cable with a Copper cross sectional area of 4mm may have a much higher current rating than Automotive 4.0mm cable where the real Copper cross sectional area is just 3.0mm, but the plastic takes the overall cross section up to 4.0mm. The reason automotive cable is measured differently is because in a vehicle the size of the hole the cable has to pass through is more relevant to the vehicle manufacturers than conductor core size, and one of the reasons why Thin Wall (thin plastic Insulation) automotive cable has become more prolific. Note that Thin Wall cable usually has a much lower max voltage rating of less than 60V, due to the thinner PVC insulation. Therefore watch out for web sites selling 4mm cable that isn't. For help on wiring a Solar Panel to a Reich e-Box see our Reich e-Box page or click HERE. Considerations when planning your Solar charging system. Length of day and the effect on Solar charging. In mid Winter in Scotland the Sun doesn't rise until about 09:00 and it's dark by 15:30. That is around just 4 hours a day when the Sun is also low in the sky. Just enough light for a 100 watt Solar Panel to generate an average 1 amp per hour, or 4 - 5 Ah per day. Throw in heavy cloud and you might not get even that. So in mid Summer there can be an abundance of 12v Solar Power, but that is exactly when you need it the least. The Heating won't be on and it stays light until 21:00 so little requirement for the LED lights, little watching of the TV, etc. In the South of the UK on a sunny day in June, a 100watt Solar Panel can generate about 60Ah a day in ideal circumstances. 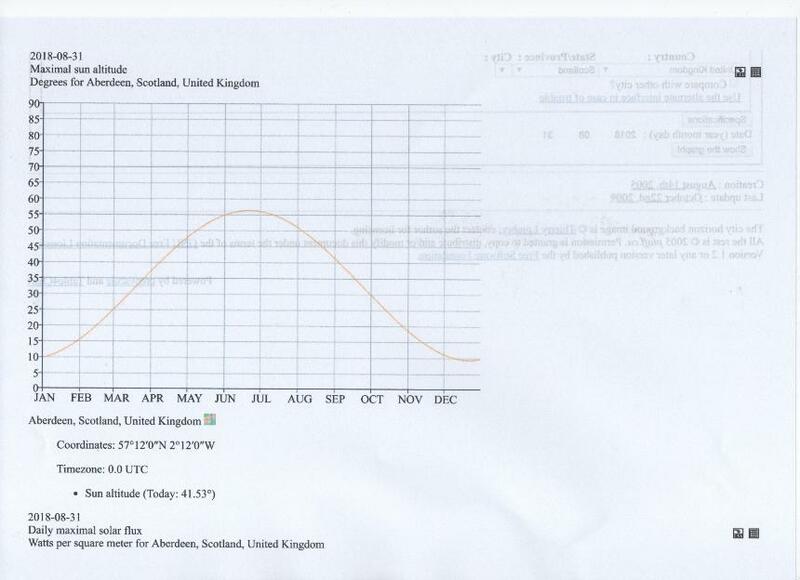 In the middle of the UK in mid Spring/Autumn conditions, the same 100w Solar panel generates about 45Ah a day which is enough to power a 12v Compressor Fridge, but the cooler, longer nights will mean a rise in 12v usage raising the overall daily total figure to close to 45Ah and a potential break even point. Obviously those figures will change as the days shorten further, increased risk of Cloud, etc. so could be nearer to 25Ah by the end of September. As the days shorten, the sun drops lower in the sky, Cloud cover thickens and Solar power generation starts to drop off quite quickly. Solar is not a consistent Power source through the Year. The Solar harvest will depend on where the vehicle is in the World, the weather and time of year. Even in mid summer the Solar harvest can vary by as much as 50% from one day to the next due to heavy Cloud cover. The Sun angle in the sky, makes a significant difference. In the South of Portugal in mid Winter a 100watt Solar Panel can be nearly 4 times more efficient than the UK. Just moving the vehicle the short distance from the South Coast of Cornwall to the North of Scotland can drop the Solar gain by 35% on the same day/conditions. The further South you go, the higher the Sun and the less it degrades, even in Winter. 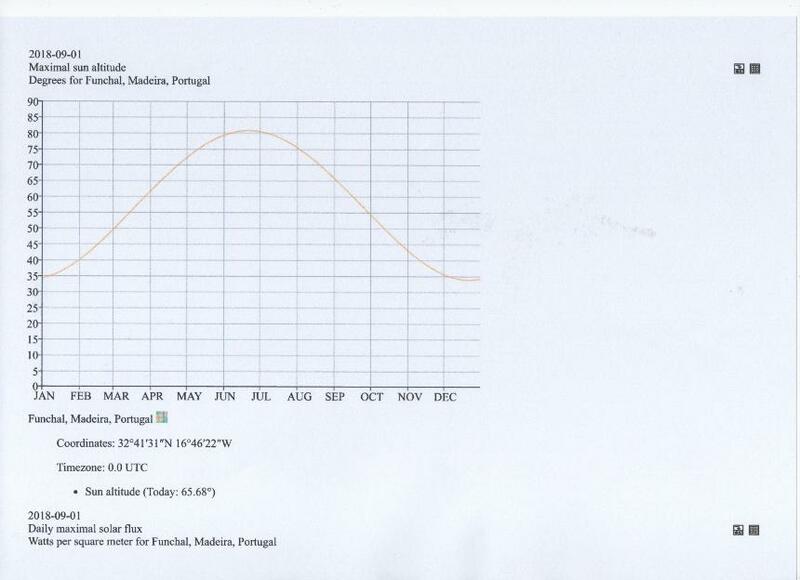 In Portugal you can expect an angle of over 80 degrees in summer. Even in mid winter it won't drop much below 35 degrees versus Aberdeen's 9 degrees, so literally up to 4 times the same power generation in December than Aberdeen. So when calculating the Solar gain allow at least 30% contingency for when conditions are not ideal. For a selection on manuals for the LR 1218, LRM 1218 and DT 220C. Use the DT220 manual to add the Solar Icon to the display, see below and also the Solar Regulator LR1218 page for more info and PIN codes.